In the last entry, I wrote about "The Four Horsemen of the Apocalypse," or four common patterns that erode relationships: Criticism, Defensiveness, Contempt, and Stonewalling. All of these are responses to and generators of pain. Left unattended, these horsemen destroy relationships; attempts to self-preserve lead to other-attack, triggering an ongoing destructive cycle. However, there is a way to reverse the cycle towards mutual care, compassion, and connection. 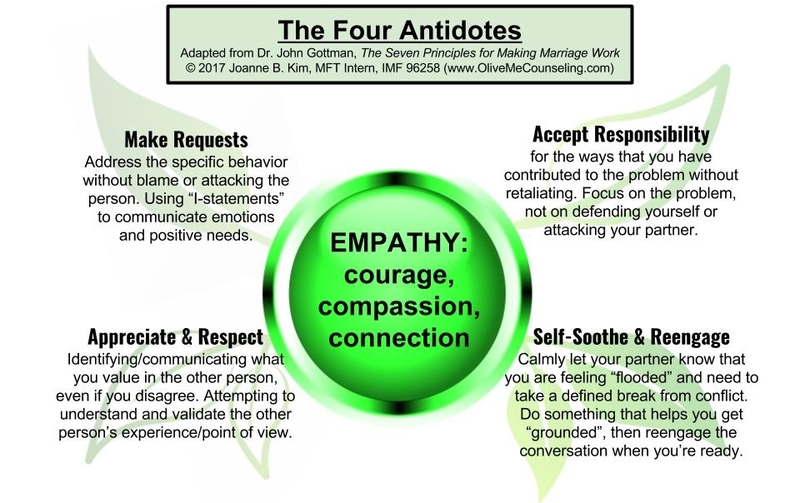 Through what John Gottman calls the "Four Antidotes," the relationship can eliminate the toxic effects of the horsemen and foster genuine EMPATHY, or the ability to be deeply connected to another while remaining fully yourself. I am valuable enough for me to bring this to your attention. You are valuable enough to be invited to make a meaningful difference in my life. I take ownership of what I am responsible for and change whatever is within my ability to enhance our relationship. Although you and I are different, you are just as valuable in this relationship as I am. Although this is a painful, I will remain emotionally connected to you. To do so, I need to take care of myself, so that I can fully show up for you. The antidotes make it possible for each person to be fully valued and connected in their uniqueness. When a problem happens, each person takes ownership of his/her own role, brings his/her own gifting, and faces the problem together. In doing so, they become truly compatible: "to suffer together", not alone. All relationships involve pain and conflict. No one is immune. However, the goal of healthy relationships is not to AVOID fighting, but to fight FOR safety, trust, and connection. When things get tough, don't give up. Slow down, do self-care, and explore what may be interfering with your ability to connect with those whom you deeply love. Like any skill, these antidotes take great focus, feedback, and fortitude. Cultivate these skills by identifying your favorite horsemen and replacing them with the corresponding antidote. If any of your horsemen seem stubborn, consider working with a professional therapist so that you can unlock your ability to experience wholesome, thriving relationships. To learn about couples therapy, click here. © Copyright 2017 Joanne B. Kim. All rights reserved.